You don’t have to live with embarrassing floating dentures anymore! With the advance in Implantology, your denture can be secure with the help of implants. And the good news is the cost of implant has decreased drastically. Depending on the case and how much bone you have left, as few as 4 implants on your lower jaw can be placed comfortably will solve the annoying floating dentures. We use a 3D scanner to precisely capture the details of your oral structures and your bite. Dr. Truong will then build the treatment options virtually and will be able to simulate the surgery and expected treatment outcomes before every beginning treatment. Once the ideal treatment plan has been agreed upon, the surgery will be completed with use of computed tomography guides, allowing for exact placement of each implants based on your anatomic needs. Finally, a set of custom-designed artificial teeth will be affixed to the implants. 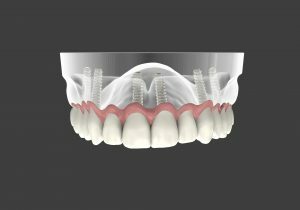 In most cases, between four and six implants will be necessary to replace an entire upper or lower jaw, and we will discuss the unique elements of your treatment plan during your initial consultation. Please note that additional cost of the procedure depends on several factors including what system the patient wants as a full mouth permanent dental Implant-supported fixed bridge. 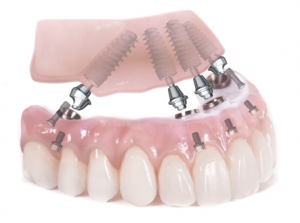 In general, All-0n-4 implant treatment concept often results in lower costs, making it more affordable, because it allows for fewer implants being placed versus traditional implant oral rehabilitation procedures. This treatment option is a cost-effective procedure for those people suffering from loose-fitting dentures, failing teeth or no teeth at all. ** Implant-supported zirconia teeth over solid zirconia base. A permanent fixed bridge. ** All acrylic teeth over all acrylic base. A temporary hybrid bridge for 4-10 months. A Zirconia Permanent Implant-supported fixed bridge is recommended for strength and durability. A combination of permanent acrylic teeth over a titanium framework ( often called a permanent fixed hybrid bridge) is preferred for durability and repairability. You will be able to eat, experience what life has to offer, smile without worry or self doubt. Implant-supported fixed bridge will change your life and help you live without compromise. Do you know that your jaw bone stays stronger and less shrinkage with implants? Schedule an hour and half Comprehensive Consultation with Dr. Truong to learn more about your benefits and options.